I found this Coconut Oil Fudge recipe and made it for my butterfly tea party. A few people have since asked for the recipe so here it is. I used a jar of coconut oil (costs about £5 in our local deli) and a little honey but I think it would have been sweet enough without any honey or syrup – but you can taste to see as you make it. Super metabolism boosting coconut oil fudge recipe made healthy with natural ingredients like coconut oil, cocoa powder, raw honey (stevia can be used if you prefer) and vanilla extract. That’s it! No corn syrup, marshmallows, frosting or chocolate chips needed. Enjoy! Coconut and chocolate is a match made in heaven! They pair well together in many of my popular recipes like my homemade chocolate bar recipe, chocolate coconut butter bars recipe, homemade “Mounds” candy recipe, homemade junior mints recipe and my magic hard shell recipe. I’ve been working on this homemade fudge recipe for months. I wanted a simple recipe that could be tweaked easily for special dietary needs. I used raw honey to sweeten our fudge but other natural sweeteners can easily be substituted in its place. Raw cacao powder can be used in place of regular cocoa powder and expeller pressed coconut oil can be used in place of virgin coconut oil (some do better with expeller pressed because it’s easier to digest). Add a few drops of Young Living peppermint essential oil or 1/2 teaspoon of peppermint extract for delicious mouth-watering peppermint fudge. 1. Measure 1/4 cup of coconut oil and scoop it out into a mixing bowl. Whip the coconut oil with a stand or hand mixer until it’s light and fluffy (like this). Note: If your coconut oil is room temperature and already liquid you can skip this step. 2. Mix the whipped (or melted if you live in warmer climate) coconut oil, cocoa powder, vanilla and salt together. Mix well and slowly add honey or sweetener of choice. Taste as you go to make sure you don’t over sweeten your fudge. Mix in 2 drops of peppermint essential oil if using. 3. Pour fudge into a 9×5 inch pan (this is a bread size pan). Spread fudge evenly cover the pan with a lid or plastic wrap. Refrigerate until fudge is set and hard, about 4 hours. 4. Cut fudge into small squares and serve. 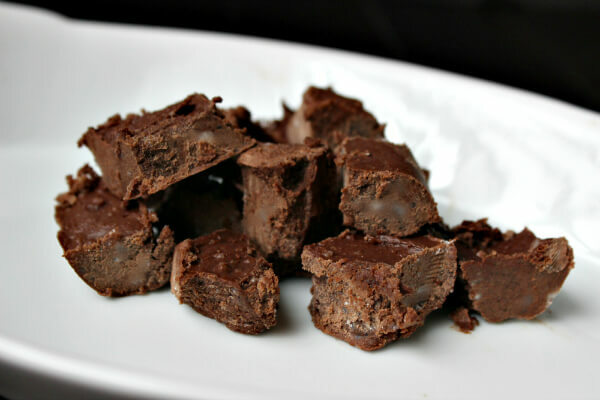 via Coconut Oil Fudge – The Coconut Mama. You’re welcome, it was so easy too, my middle little (age 6) made it with me but tiny ones could easily help…and pretty healthy for them! Wow, nice information and steps to create on Chocolate Fudge Recipes. Chocolate Fudge is good for health and tasty. I will try this. But previously, I got this kind of information from steviamystore.com. Thanks for sharing. Thanks Merilyn, it is a great recipe for the dairy free people in my life!